This sculpture depicts an old story. Predator-prey. To some, good vs. evil. The majesty of a stooping peregrine falcon. The abundance of prey that supports a lesser number of predators. The cycle of life  and death. Time passing while life processes continue. 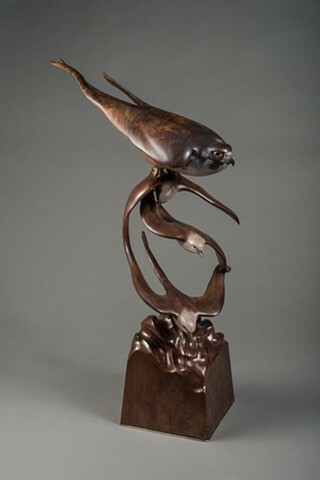 As a sculptor working in wood, one comes to appreciate the story of the wood. In the late 1960s, the artist planted the walnut tree that the peregrine was carved from. After four decades, it was still a young tree when it was cut. The wood for the base has an even better story. The artist grew up along the Old Maumee Road east of Ft. Wayne, Indiana. That was the first road that was paved heading east of Ft. Wayne, and became part of the Lincoln Highway. When an old house across the highway was torn down in the early 21st century, the artists father went to look. He found an ax hewn beam with square nails that was walnut. He salvaged the beam, and part of it has been repurposed as art depicting a scene in nature. Some of the ax cuts, holes from the square cut nails and worn holes were left in one side of the base to remind us that the wood we use has a history, too. This two hundred year old beam came from a tree that started life long before men of European descent ventured west of the Appalachian Mountains. And it could have been a couple hundred years old when it was cut to be part of the old house. It was witness to incredible changes. As we pass along on our lifes journey its good to be reminded that much has gone before us, and many unforeseen changes will happen in the future. And all the while, natures cycles are repeated. Time passing while lifes processes continue . . .